The eyebrow dormer is another one of those features that goes under the heading of "My wife insisted on it." 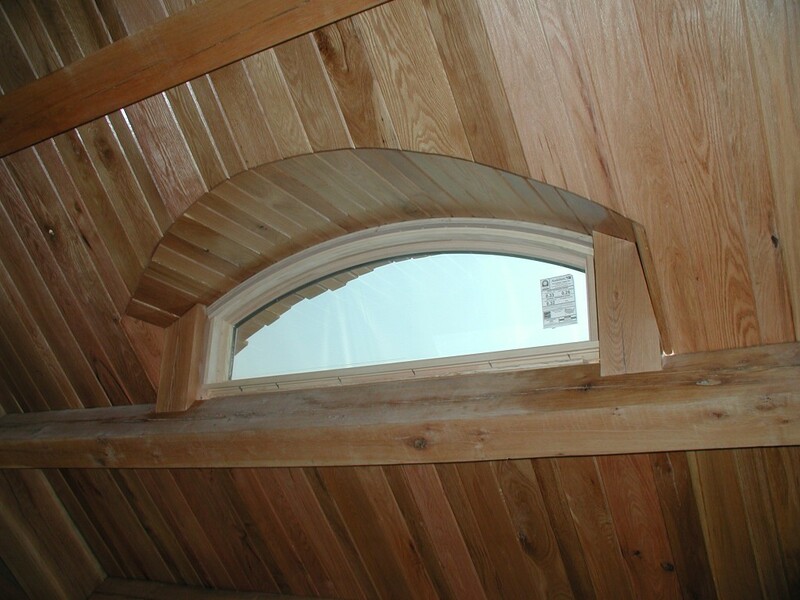 I had no clue how of to build an eyebrow dormer, and neither did my brother-in-law, but he instinctively knew how to get started... "just have her order the window and when it gets here, we'll build around it." So that's what we did. Long ago while planning the frame, I knew there'd be a dormer in this area, so I was careful to make sure that purlins were spaced appropriately in the frame. (Of course, in the back of my mind, I was ready to fall back to a "shed roof dormer" if only my wife would let me.) But she didn't relent - she ordered the window. When the window arrived, we carefully lifted it into place and discovered that the proper height was just a couple of inches above the lower purlin and the dormer would clear the upper purlin by a few inches (whew!). To get the height just right, we nailed some 45 degree blocks and a few 1" spacers on the purlin. Then we cut two mini-timber-posts to sit to the right and left of the window. We then nailed the window and the mini-posts to the purlin and plumbed everything. Finally, we took a strip of wet plywood (the 3/4" cabinet grade stuff that has oak veneer with poplar plys is especially bendy) and bent it over the window, nailing the plywood to the window and to the miniposts at each end. The really tricky part came when it was time to cut the tongue and groove. We ran the tongue and groove for the 12:12 roof, and then using a square and level, projected the curve of the window back on to the 12:12 roof. I used a skil-saw (circle saw) to cut the curve out of the main roof. (again, my brother-in-law was right, you can cut curves with a circular saw - just don't set the blade to run any deeper than absolutely necessary.) Then using a miter-saw, we cut the compound angle for every piece of dormer-tongue-and-groove. This was tedious work, as every pair of angles for every piece of tongue and groove was different, and a lot of it was trial-and-error. I used mainly 3" and 4" tongue and groove (avoiding the 5" 6" and 7" stock) pieces to better approximate the arc of the window. And to simplify the cutting a bit, I let the tongue and groove run wild, past the outside of the window (see picture)... I'll cut all of those ends even later when I decide how much overhang to incorporate into the dormer. Placing this window and making the tongue and groove look right took about 24 person-hours of time (two people, one and a half days). I expect the slate on the outside to be even more tedious. But it will all be worth it - this may be the only eyebrow dormer I ever build in my lifetime.